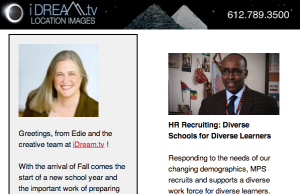 You are here: Home / News / Check out the Fall Newsletter! We’ve just sent out our latest newsletter to subscribers through Mailchimp! It’s a great over-view of the educational work we’ve covered and the awesome videos we’ve made with so many education-focused clients! Since the newsletter is a new effort for us, we do appreciate any suggestions you may have about content, layout, colors, flow, or anything! email usHERE.